Wrap Up: Are Push Notifications Something YOU Can Monetize? Speaking of affiliate marketing and media buying, it’s very exciting when a new ad format becomes available and shows signs of great potential from the very start. Push Notification Ads are just that, and PlugRush recently added them to their arsenal of ad formats. Push Notifications are essentially native ads delivered straight to the home screen of a potential customer for you. The affiliate marketing game is constantly evolving and well-established ad formats like the traditional banner ad become so competitive, that it’s a breath of fresh air when something new comes along and brings fresh opportunities to monetize end users. That’s the case in point here. Why? Let’s start with what proves as the strongest advantage that push notifications have compared to anything else – the user’s consent. Push notifications are small messages sent to the user by websites or mobile apps that they visited. While on the website (or in the app), the user has actively opted-in for receiving these push messages. Needless to say, this primes them for a great conversion rate. Users who decide to receive your push notifications are naturally more interested in your advertisement than someone who just saw your ad on a random web page. You’re probably eager to reach the point where we show you how to get down to business and launch your push campaigns, right? Setting up your push campaigns on PlugRush is super simple. Believe it or not, it only takes two steps. Upload creatives: for best results pick square images 192px x 192px or larger. If you don’t have square images, you can upload them anyway and then crop during the push ad creation process. Check here to see what we mean. Create ad campaign: once you’ve uploaded your creatives, and your ads are created, go ahead and build your campaign. By choosing PushAds as the delivery method, you’re going to be able to assign the ads from Step 1 to the campaign in the creator. Here’s how that looks like. 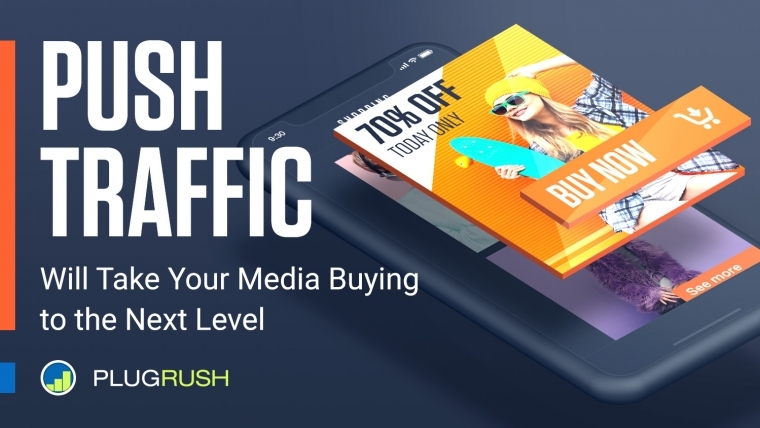 If you go through the Push Ads Guide for media buyers available on the PlugRush platform, you’ll get to know the format and how to work with it in detail. We highly recommend you do that! Because you’re a serious affiliate marketer, and not just some dude looking to make a few quick bucks here and there, we’re gonna give you an insider tip to help you get on the right track with your push ads. When you’re setting up your campaign, make sure to use conversion tracking and Automated Rules. Because you’re gonna save a ton of precious time. All you’ve gotta do is set a few smart rules and your campaigns will auto-optimize even while you sleep. Read more about this true life-saver here. Now that you know the value of the platform’s automation, having robots do most of your optimization work for free seems like a no-brainer, right? The short answer to that question: Definitely yes. The long answer: Because push ads are such a game changer and deliver the advertisement directly to the end user, you’d be a fool not to include them in your offer monetization strategy. These ads should be an integral part of any well-planned digital marketing strategy. If you make Push Notifications a staple in your arsenal, we promise you won’t regret it.